I offer this chant for those who pass that way. Hāpuʻu and Kalaʻihauola were supernatural grandmothers of Piʻikea, wife of ʻUmi-a-Līloa. They wanted to have a grandchild to take back to Oʻahu to raise, because the mother of Piʻikea, Laieloheloheikawai, belonged to Oʻahu. (Laieloheloheikawai sent Hāpuʻu and Kalaʻihauola to the Island of Hawaiʻi to bring back one of Piʻikea’s children.) ʻUmi refused. Then, people in the village started to die at night; the supernatural personages of Hāpuʻu and Kalaʻihauola murdered the people … this continued every night, the people dying without cause. Then, when Hāpuʻu and Kalaihauola were at the house with Piʻikea, the latter being pregnant with child, the old women slapped on Piʻikea’s knees and the child was delivered in front of one of the old women. “Within a few yards of the upper edge of the pass, under the shade of surrounding bushes and trees, two rude and shapeless stone idols are fixed, one on each side of the path, which the natives call ‘Akua no ka pali,’ gods of the precipice”. “They are usually covered with pieces of white tapa, native cloth; and every native who passes by to the precipice, if he intends to descend, lays a green bough before these idols, encircles them with a garland of flowers, or wraps a piece of tapa round them, to render them propitious to his descent”. The two stones, believed to embody two kupua goddesses, Hāpuʻu and Kalaʻihauola, on each side of Kalihi Stream, are also associated with the ‘E‘epa (small folks related to the Menehune,) that would cause rain if the proper offerings were not left near these stone. Travelers to the area placed lei and flowers upon the stones, at the same time asking the ʻEʻepa not to play tricks on them. A favorite lei offering was made of the sweet smelling pala palai fern. The pools marked the spot where the great god Kane struck the earth and brought forth water. It is called Ka puka wai o Kalihi, the water door of Kalihi. The two famous stones were destroyed by bulldozers in October 1953 when the men first cleared the area for the approach road for the Wilson Tunnel. 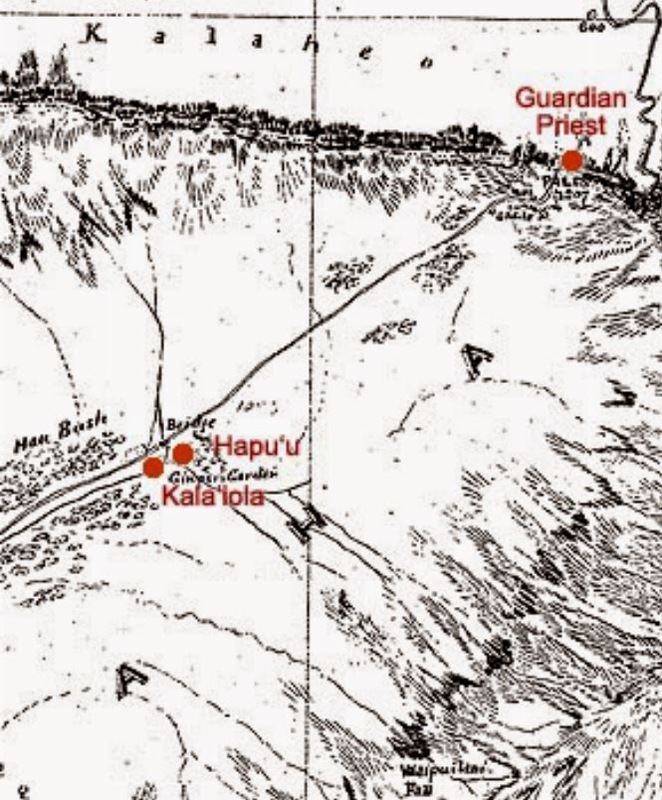 The image shows general former locations of Hāpuʻu and Kalaʻihauola (prezi.) In addition, I have included other related images in a folder of like name in the Photos section on my Facebook and Google+ pages.